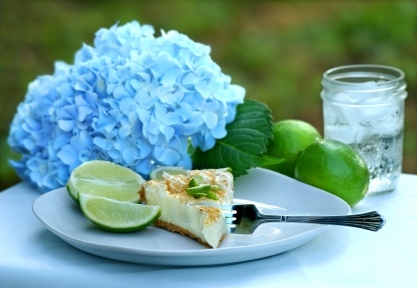 This homemade key lime cheesecake recipe is incredible. Creamy; not to tart and not to sweet - a perfect blend of flavor. Offering many fresh lime recipes below. In a mixing bowl, combine the melted butter, 2 tablespoons of the sugar and graham cracker crumbs. Mix well. Press the crust firmly over the bottom of a 9 inch spring form pan. Set aside. In a saucepan dissolve the gelatin the key lime juice, about 5 minutes. Add 1 1/4 cups of the sugar, eggs, egg yolks and lime zest. Mix well. Over medium heat, cook until the mixture thickens and is pudding like, about 7 to 8 minutes. Remove from the heat. In the bowl of an electric mixer, fitted with a paddle attachment, beat the cream cheese until smooth. With the mixer running, add the lime mixture slowly and beat until smooth. Remove the mixture and turn into a bowl and cool completely. Cover with plastic wrap and refrigerate until chilled, stirring every 10 minutes. In a bowl of an electric mixer with a whip attachment, place the egg whites and remaining 1/4 cup of the sugar. Whip on medium high until stiff peaks form. Remove the lime and cheese mixture from the refrigerator. Fold the egg whites into the lime mixture and blend thoroughly. Pour the mixture into the prepared crust. Cover with plastic wrap and refrigerate until set, about 4 hours. Remove from the refrigerator. Run a sharp knife along the sides of the pan and remove the spring-form. Spread the whipped cream evenly over the top of the cake. For the candied zest: In a saucepan over medium heat, combine the simple syrup and the lime zest. Bring the liquid to a simmer and cook for 3 to 4 minutes. Remove the zest from the liquid and cool on parchment paper. Cut the cake into individual servings. Garnish with blackberries.